This is Version 2 of Flyin' Trike. After we sold this trike, the new owner had wanted to change some of the very same things we thought it needed. The Seat: If you look at Version 1, you will see a custom chopper solo seat. People's perception was that the seat "hurt" - even though the gel pads fit perfectly on most anatomy and it didn't hurt at all. So in Version 2, we added a comfy seat styled like the original Radio Flyer trike. The Storage: Version 1 had no storage. For version 2, we fabricated a bracket to hold a vintage swim basket which we had powder coated to match the trike. 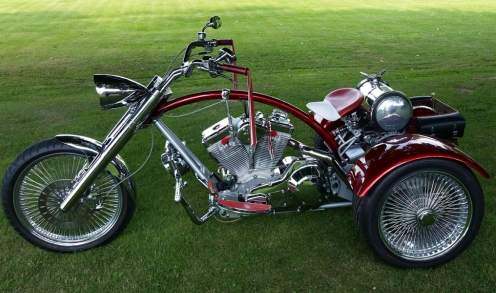 *** Click here for more information about trike conversions.